Chief Minister Prem Kumar Dhumal dedicated two newly constructed blocks of Government Degree College Bangana that completed at a cost of Rs.7.73 crore. He said that Government Degree College Bangana would be named as Atal Behari Vajpayee Government Degree College, Bangana. Chief Minister also inaugurated the Sub Divisional Magistrate (SDM) office at Bangana. Chief Minister also inaugurated Drinking Water Supply Scheme at Thana Kalan, constructed at a cost of Rs. 294.27 lakhs which would benefit about five thousand people of 11 gram panchayats besides dedicating Gau Sadan at Thana Khas, constructed by Kamdhenu Manav Seva Samiti. He said that new park in Bangana would be named after Thakur Ranjit Singh. 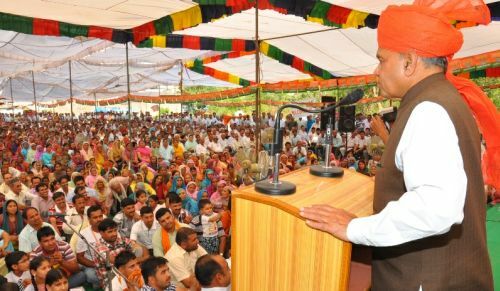 While addressing the public rally Chief Minister Prem Kumar Dhumal claimed that State Government had spent over Rs.315 crore on providing facilities of roads, bridges, drinking water and irrigation facilities in Kutlehar assembly segment of district Una. Chief Minister said that irrigation schemes worth Rs. 140 crore had been provided to the habitants of Kutlehar segment, Rs. 53 crore spent over drinking water supply schemes besides spending about Rs. 7 crore under flood control and hand pumps in the segment. He said that Rs.344crore had been spent on construction of roads, bridges and buildings in the district during present Government regime. He said that hundreds of crores of rupees were being spent under Swan River Channelization Scheme to reclaim the land washed away in swan river floods. He said that a private university, central school and many such institutions had been opened during BJP regime in the district. Chief Minister said that besides science classes, BBA, BCA and PGDCA classes would also be started in Atal Behari Vajpayee Government Degree College, Bangana. He said that Government would consider opening of PHC at Raipur to cater to health needs of local people. He announced construction of Mini Secretariat Building for SDM Bangana, as combined office building to house all offices under one roof. He said that efforts were afoot to start construction work on Dhaneta-Bangana tunnel. Chief Minister expressed concern over the practice of abandoning domestic animals and leaving them astray at their fate which was contrary to the ethics of Hinduism. He said that animals were integral part of our social system which needed to be protected. He said that the State Government had been providing land and other required help to construct Gau Sadans in different parts of the State to provide shelter to the cows left astray so that crops of farmers were protected and ethics of Hinduism upheld in its true spirit. He appealed to the people to come forward in saving cow, the sacred animal. Prof. Dhumal congratulated people of Bangana area on opening of Sub-Division (Civil) office which was second after one opened at Sangrah in district Sirmour by the present Government. He said that SDM office at Bangana had started functioning with the issuance of first license and certificate to local applicant. He said that all promises made with the people of Bangana had been fulfilled and people henceforth would be availing administrative and revenue services locally. He said that population of 73,004 of the area would be benefitted with the opening of SDM office and 51 patwar circles would be functioning under the same. He said that politics had been a source of dedicated service to the people of the State and not an opportunity to enjoy the same. 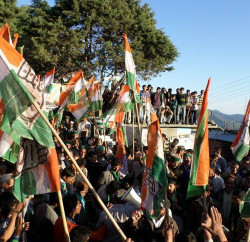 Chief Minister said that new record had been set in strengthening road network in district Una during past four years by spending about Rs.200 crore over roads and buildings while projects worth Rs.80 crores were in progress and new projects valued at Rs.70 crore were in the pipe line which would further strengthen connectivity in the district. He said that road and building projects worth Rs.110 crore had been completed and some of them were at different stages of completion in Kutlehar Assembly segment of the district. Prof. Dhumal also listened to public grievances after the public meeting. 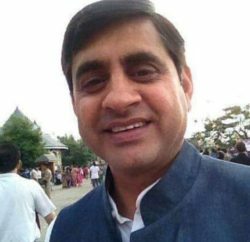 Satpal Singh Satti, MLA and President, State BJP said that it was BJP regime which had provided 50 percent reservation to women in panchayati raj institutions and were contributing significantly towards the development of areas of the district. He criticised previous Congress regime for not increasing even one rupee in social security pension. He said that PMGSY scheme was launched by NDA under the leadership of Shri Atal Behari Vajpayee which had revolutinised road connectivity. Expressing concern over rising prices, he appealed to the people to play proactive role in All India Jail Bharo Aandolan call given by BJP to protest against price rise. 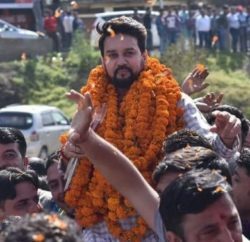 Anurag Thakur, MP Lok Sabha and National President, Bhartiya Janta Yuva Morcha, congratulated people of Bangana for boring record 600 hand pumps and spending over Rs. 85 crore over drinking water supply and irrigation schemes during past four years. He said that common man was badly crushed under rising prices who were finding it difficult to make their both ends meet. He compared prices of essential commodities of UPA regime with NDA regime. He said that BJP regime in the State was providing subsidised essential commodities to every ration card holders and was spending Rs.150 crore annually over the same. He said that petrol prices had increased 14 times during past three years. He thanked CM for increasing daily wages by Rs.55 taking it to Rs. 130 now. He said that Atal Swasthya Seva was rendering free transportation services to patients irrespective of their economic and social status. He charged UPA as the most corrupt government at centre since independence as scams worth thousands of crores of rupees had taken place during UPA regime. Virender Kanwar, local MLA and CPS, welcomed the Chief Minister to his home segment and said that June 10, 2012, would be remembered as a red letter day in the development history of Kutlehar assembly segment by dedicating developmental projects worth over Rs.11 crore and above all new Civil Sub Division which would benefit about 70 thousand population in the area with various revenue and administrative services available to them locally. He thanked for providing funds worth hundreds of crores of rupees for improvement of Una-Bangana road and other link roads. Ravinder Singh Ravi, IPH Minister, Balbir Chaudhary, MLA, Praveen Sharma, former Minister and Vice Chairman, Water Management Board, J.R.Katwal, DC, Sumedha Dwivedi, SP, Dr. Dinkar Burathoki, Director of Education, other prominent people and senior officers of different departments were present on the occasion.